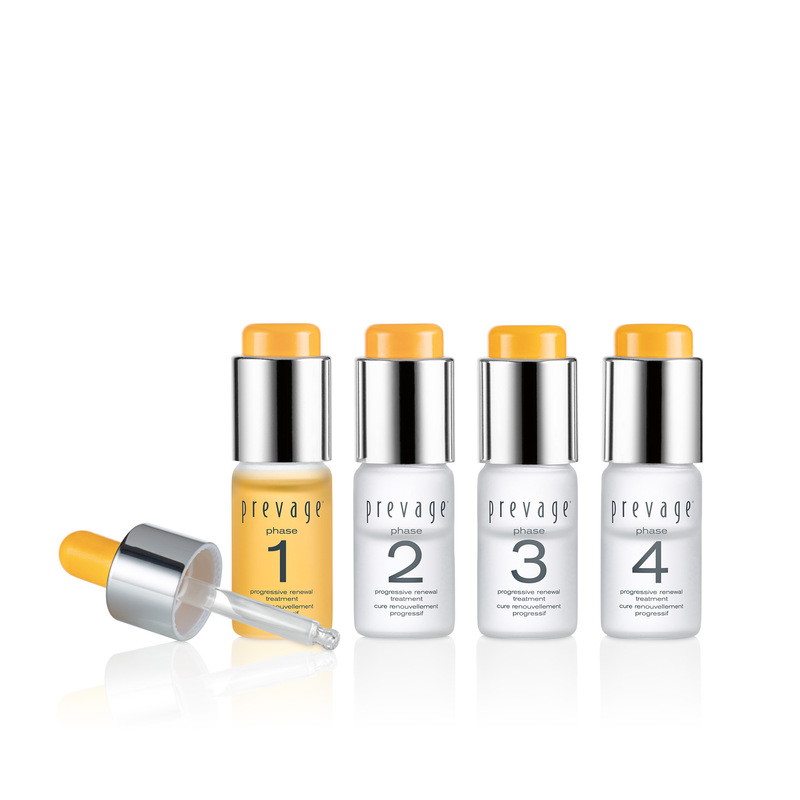 PREVAGE® Progressive Renewal Treatment is rated 4.7 out of 5 by 189. A new, intensive 4-week at-home face peeling treatment formulated to provide increasingly stronger resurfacing benefits, plus powerful antioxidant protection, to reveal smoother, brighter, younger-looking skin. Apply nightly after cleansing. Suitable for all skin types. Clinically and dermatologist tested. This product is excluded on any exclusive offers. Skin cell renewal slows down as you age. In your youth, skin cell turnover happens approximately every 28 days. When you reach 45 or 50, cell turnover occurs every 45-60 days, and slows down more after 60. You need to gently exfoliate dull surface cells to accelerate cell turnover and reveal significantly smoother, brighter, younger-looking skin. 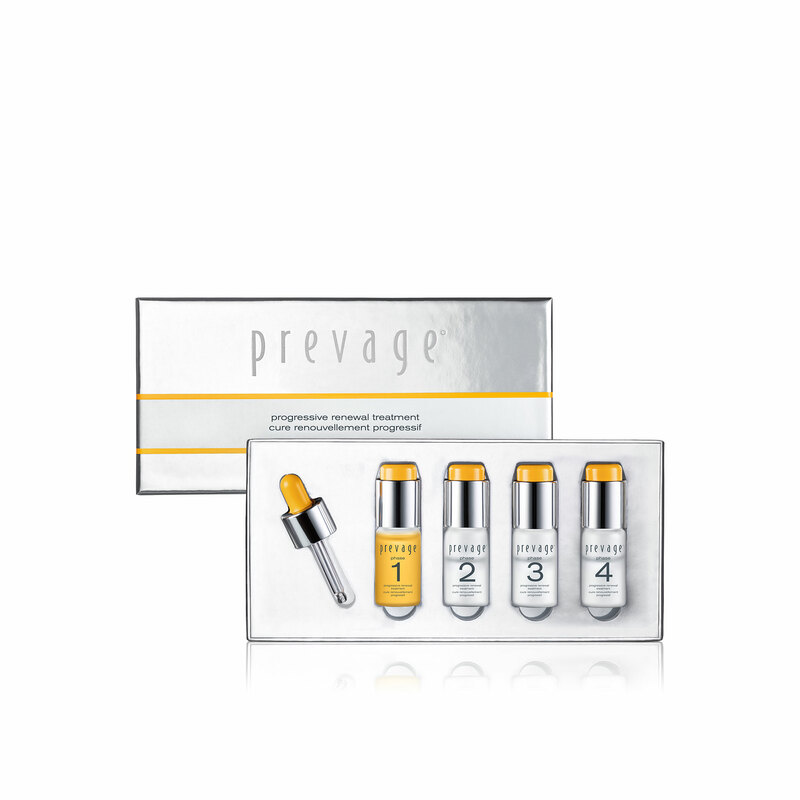 PREVAGE® Progressive Renewal Treatment is an intensive 4-week at-home peeling treatment formulated to provide increasingly stronger resurfacing benefits, plus powerful antioxidant protection from Idebenone. Hydroxy acids are naturally derived acids that gently exfoliate surface skin cells. The hydroxy acid resurfacing power increases gradually over 4 weeks to condition your skin for the stronger levels of acid at the end of the treatment. 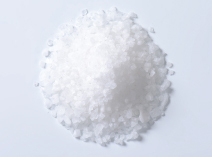 In addition to alpha hydroxy acid (AHA), a next-generation polyhydroxy acid (PHA) is also used. 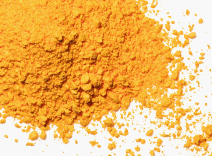 PHAs have larger molecules and offer gentler exfoliation when compared to AHAs, plus PHAs have other benefits like moisturization and skin barrier strengthening. Idebenone, the supercharged antioxidant, combines with the hydroxy acids to protect newly-revealed skin cells from free-radical damage. Buffered ingredients in this treatment keep the pH level optimally low on skin to ensure continuous and maximized results. See your skin transform week after week. Four weeks to significantly smoother, brighter, younger-looking skin. This advanced combination allows for gentler resurfacing than products that are formulated with AHAs only. Idebenone combats free-radical environmental aggressors like, sun, pollution and smoke, all of which accelerate the signs of aging. Skin’s natural reaction to a low pH product being applied to it is to balance itself, minimizing the efficacy of a typical peeling product. 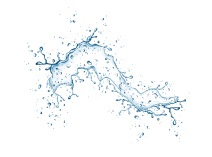 Our treatment was formulated with buffered pH to ensure continuous and optimum efficacy at a low pH. 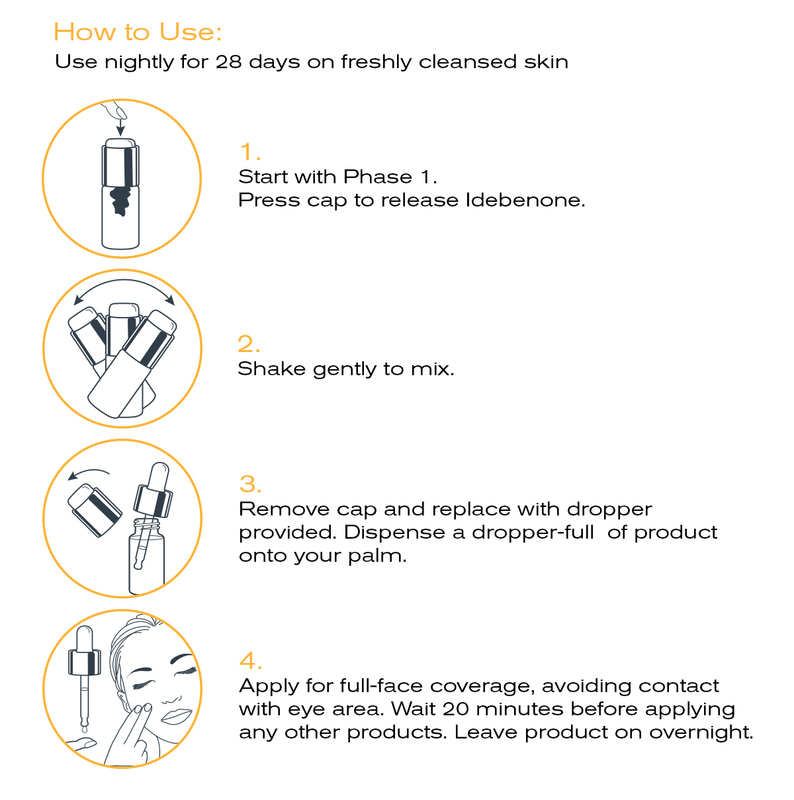 Use Phase 1 for 7 days, shaking lightly to mix before each application. At start of Week 2, change to Phase 2 and follow steps 1 - 4 every night through end of Phase 4. Rated 5 out of 5 by MaryV from Making a difference! I'm still in week 1 and while I'm not able to provide objective info, there is an improvement! I like! Rated 5 out of 5 by mkelly from Love this System I was sent this system for review by Elizabeth Arden and I love it! It's so easy to use but the results are in line with an in spa treatment. Can't wait to get to week 4 to see my final results! Rated 5 out of 5 by Bart from Truly Effective I received the Prevage Progressive Renewal Treatment early January and couldn't wait to get started. Honestly, I was nervous as I had some travel booked but this nightly solution was incredibly easy to incorporate into my existing routine *and* it was super travel-friendly! It worked with all my night time moisturizer options (I do rotate) and never once did the powerhouse cocktail leave my skin feeling dry, tight or red. What it did, however, was make my skin insanely smooth. The visible radiance upgrade was remarkable about halfway through the 28 days. My pores are slightly less visible, too! Each weekly dose is also rather generous in size so it's perfect to share with your other half. 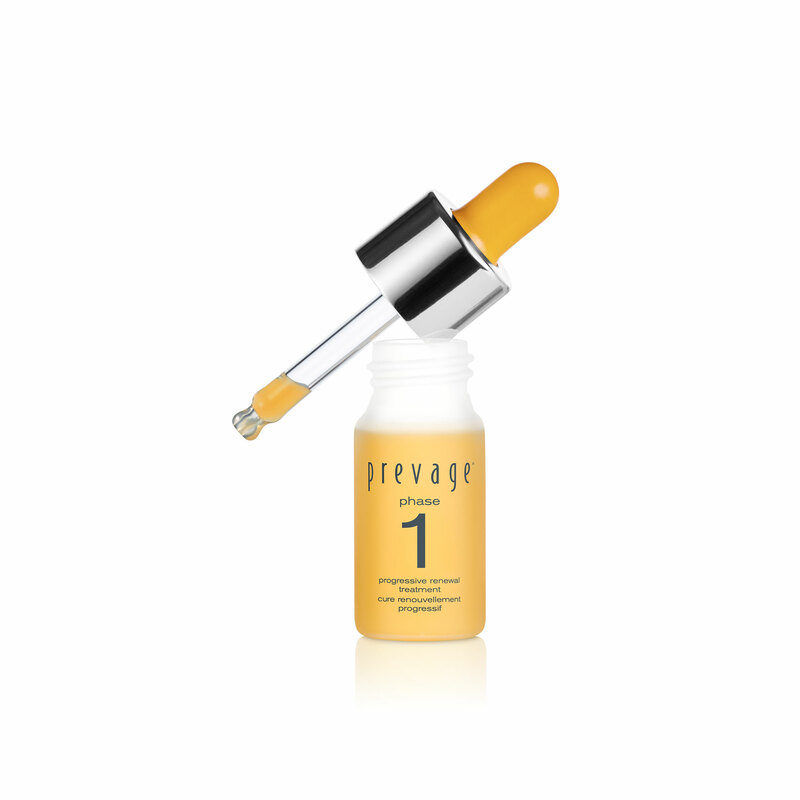 I've been a fan of Prevage since its early days and this treatment will be new semi-annual ritual. Most appreciated reset button in skincare. Thank you! Rated 1 out of 5 by chefsandyp from I feel duped. No difference WHAT SO EVER! I used all 4 vials exactly as instructed. I wasn't surprised when I didn't see a difference after the first 2 vials but so extremely disappointed that I didn't see even a slight difference after all 4 vials were finished. In fact the texture of my face is worse. I have used Prevage products for 2 years so I was excited to try this. Money wasted!! Rated 1 out of 5 by Christina1422 from No results!!! Waste of money Did not see any results in 4 weeks. Very sticky and felt dry. I used every night for 4 weeks waste of time and MONEY! Can this product be used on younger skin? I am in my early 20s, and although my skin does not have any lines, it does have some dark spots and slights scars from teenage acne. I tried to find a review from a younger person but I could not. Hello, Colettek! We've formulated our Progressive Renewal Treatment not only for clients wanting to reduce the appearance of fine lines and wrinkles but also for clients like yourself, that wish to reduce the appearance of dark spots caused by sun exposure or acne scarring. This being said, we definitely encourage you to try the treatment! How many sets should I use to achieve the best effect? Should I take a break between two cycles? Thanks in advance. Hello, Jennyjyo! Results are guaranteed after the first set! We recommend waiting at least a month between each set. Do you recommend Superstart before applying this? Do we follow it up with prevage serum and moisturizer? Hello, EmilyEA! Our Progressive Renewal Treatment is to be used on freshly cleansed skin with no product on it. 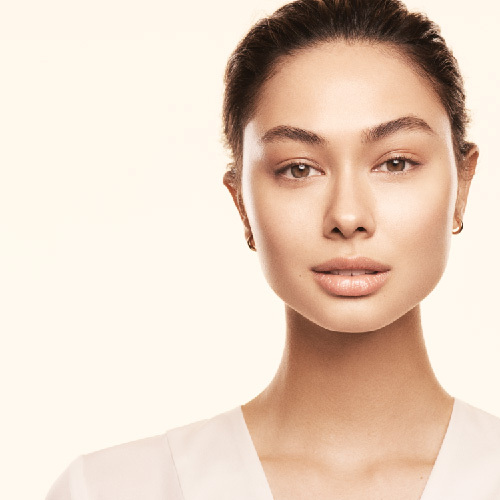 You can certainly follow up with the Prevage Serum and Moisturizer, making sure yo allow 20 minutes to pass after applying the treatment before doing so. Can this be used on all skin types/safe for African American skin? Hello! Our products are formulated for all skin types and races, so it will be completely safe to use the Progressive Renewal Treatment in African-American skin. I'm on phase 1 for 5 days now. I still have 1/2 a bottle left. Do I stop at day 7, then continue with phase 2 to 4, and repeat the steps? Or do use up the bottle first? Hello there! You would stop at day 7, even if there's some product left. Once the 4 weeks are over, we recommend waiting at least 3 months before re-starting the treatment. Hope you love the results! After finishing 4 week treatment when can I repeet it again? Hello there! We recommend you wait at least 3 months between treatments to allow your skin to re-acclimate. After doing step one you had said wait 20 before apply serum and moisturizer. Is it okay to use Retinol Ceramide Capsules then night cream or use daily serum instead?